South River Candle Co. was created to maximize over 15 years of candle manufacturing experience. The Luxury Candle designs from SRCC are all about fine fragrances. 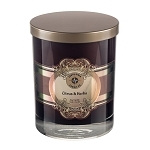 We wanted soy candles that not only smell strong but offer fragrances that stand out. Our perfumers created fragrances that go outside the box to achieve new aromatic sensations.